The three Scottish brands Glenlivet, Longmorn and Aberlour deicided to cooperate for a gift with purchase marketing campaign for whiskey. In the first photo here above you can see a giant LED display, advertising the products of the promo in the foreground and the concerned gift below. This marketing campaign for whiskey consists in advertising the products and make them more appealing though a free gift. 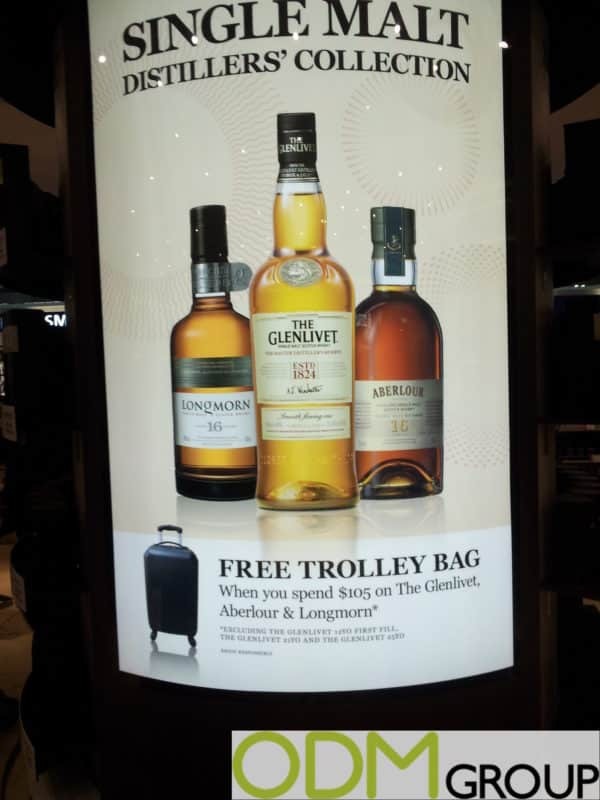 With the purchase of minimum $ 105 of these three whiskey brands, the client receives a free trolley bag. About the display, the writings are clear and you just need a glance to tell what the promo is about. The main message is sent with few highlighted words and widely visible images of the products. 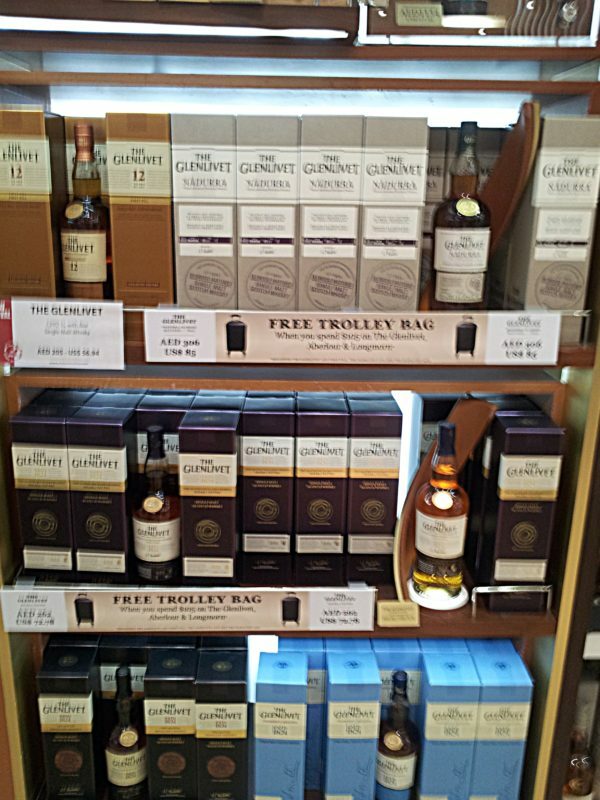 In the second photo instead, is shown the marketing campaign for the Glenlivet whiskey on the shelves. Now that the customer knows about the promo, it is easy to recognize it in the shelves thanks to the signboards under the bottles. A tidy and very refined section, this are the feelings that it communicates. The packed bottles are accurately separated and a sample one is left as invitation to the customer. Why do we like this marketing campaign for whiskey? POS display: The Scottish brands made use of a LED display to enhance their marketing campaign for whiskey attraction. This is smart and very effective. It’s not a standard carton POS display but it exploits our instinct to be attracted to bright things. Plus, the simplicity and readability of the advertisement make it more striking than many other POS displays. Also, the mini display and the sample on-shelf bottles higher the attractiveness of the products. People prefer to see and touch the products before buying anything. Promotion: Now that they found an excellent way to tease customers’ interest for their marketing campaign for whiskey, they needed a good promo to convince them to buy. Here it comes their gift with purchase strategy, a trolley bag in this case. It is not just a random item, but a complimentary gift to the purchased products. The promo was found in an airport, which means clients will need it to put their whiskey bottles and other purchases they made. Credibility: Everything from the display to the organization of the shelves gives an idea of serious and high-end brands. It consequently leads to the belief of a quality and design-appealing trolley bag. For a price of $105 clients would expect something more than a low-cost giveaway bag. Although the consumer is not going to adhere to your promo in the end, you anyway raised you perceived brand value and awareness. If you also are interested in a similar marketing campaign with POS display and free gift, please don’t hesitate to contact us. We will provide you with our quality sourcing, designing and manufacturing services necessary to help you in your next promotional campaign.